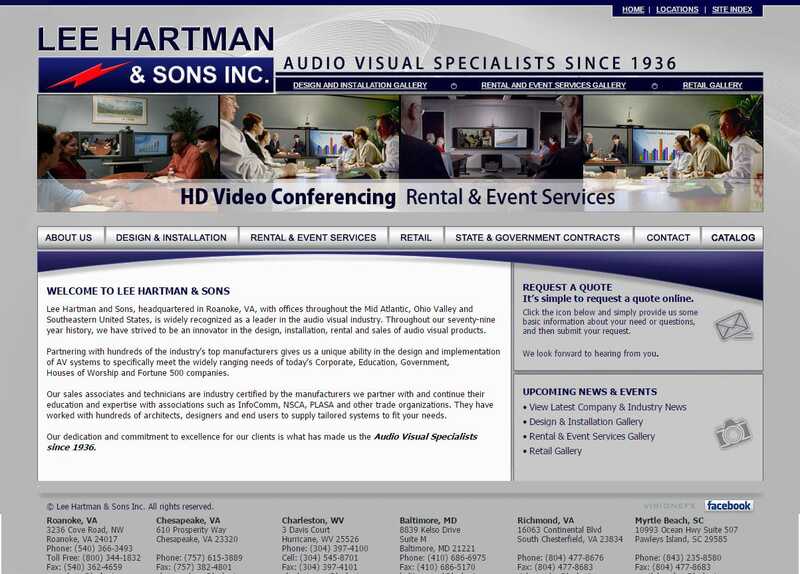 Website design Roanoke VA | This technology business website based in Roanoke, VA. This is an open source PHP script website. The sales and product pages are complimented with a unique historical section about the enduring success of Lee Hartman & Sons. It contains advance mega-menus with link text, short descriptions and graphics. The mega-menus drop down as an overlay with an image thumbnail and brief description of content for interior pages. The website generates online customer leads and support existing customers. Search ‘Website design Roanoke VA’ look no further than the web design experts at VISIONEFX. VISIONEFX, a Web design company based in Virginia provides services to national companies as well businesses throughout the United States. Services include-custom web design, web development, E-commerce web design and product database programming, Word Press web design, Word Press Plugin customization, Joomla web development, SEO – search engine optimization and website maintenance and support with an enthusiastic sense of urgency. Call VISONEFX at (757) 619-6456 or email direct to info@visionefx.net.